Welcome to the Ultimate Guide to Riding the Trans-Siberian Railway! Kara and I just completed our 11 day Trans-Siberian journey from Moscow to Vladivostok. Our entire journey covered over 9,280 km. We spent 7 nights sleeping on the train, 4 nights sleeping in cities a long the way, and consumed far too many instant meals to count. We have traveled to over 60 countries, and the Trans-Siberian has been one of the hardest trips I have ever planned. First, we had to sort out our Russian visas. Next, we had to figure out our route. Then, we had to figure out how to buy the train tickets (without getting ripped off), and that was just the beginning of the planning. Before leaving for this trip, I really struggled to find all of the information I needed to plan and book this trip independently. It was even harder to get a feel a for what the trip itself would actually be like. So, I’m hoping this blog post can serve as a practical guide to help you plan your trip, and our YouTube videos will give you an idea of what to expect day in and day out. If you’re wondering why you’d ever want to spend 11 days riding across Russia on a train, check out our YouTube videos from the trip! 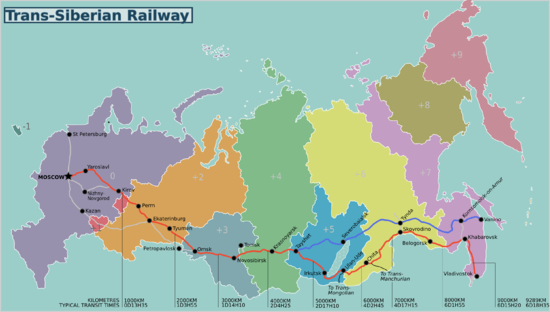 This entry was posted in Documentation, Music/Video and tagged Moscow, Trans Siberian Railway, Vladivostok. Bookmark the permalink.